Peach leather turned out to be our favorite preserved fruit last year. I say "our", but I'm ashamed to admit that I mostly ate the delicacy for my solitary breakfasts, so Mark didn't get to enjoy the dried fruit. Once he finally got a taste of the peach leather, it became clear that I'd better make more this summer so that we could share from now on. Next, check the weather forecast. If you're relying on sunshine to dehydrate your fruit, you'd better find at least a day and a half of hot, sunny weather. Don't start your leather on a sunny afternoon if it's slated to rain the next day, or your fruit will go bad. 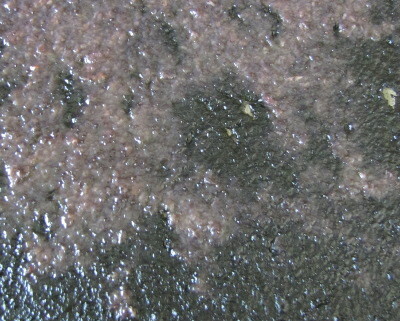 If the leather turns gray (like this), starts to smell, or gets moldy, you'll have to throw it out. To be on the safe side, it's best to always start fruit leather first thing in the morning. 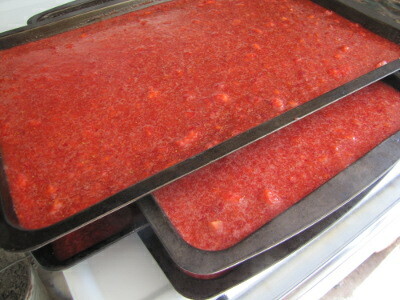 With all of those preparations out of the way, it's actually very simple to make strawberry leather. 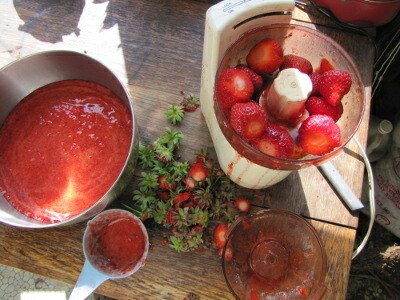 Rinse your fruits if they're truly dirty (or came from someone else's place), then cut off the tops and turn the strawberries into puree in the food processor. Measure how much puree you have and add 1 tablespoon of honey and 0.5 tablespoons of lemon juice per cup --- the honey sweetens your fruit and also helps the leather stick together while the lemon juice preserves color and kills microorganisms. Pour about a cup and a quarter of doctored puree into each cookie sheet and tilt the pan until the fruit evenly covers the surface. 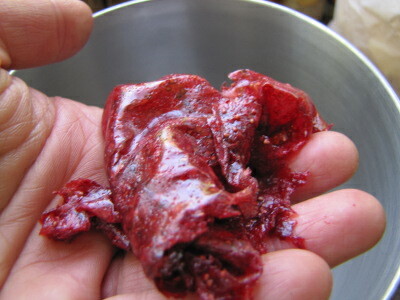 This will make a paper-thin leather, which is what's called for with solar dehydrating since the thin layer of fruit will dry in a day or two. If I was running an electric dehydrator, I might use two or even three cups of puree per tray to make a thick leather like you'll find in the store. 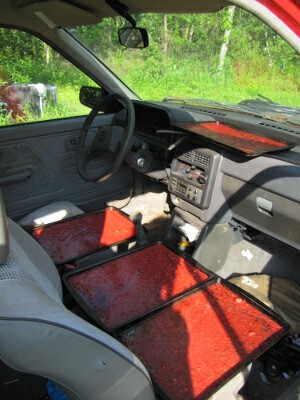 Stack your trays as shown above and you can carry up to five trays at once as you head out to your hot, dry spot. It's possible to simply dehydrate fruit outside in the sun, but the process will take longer and you'll have to cover the leather with a screen to keep out bugs while letting water escape. Mark wishes I would let him make me a real solar dehydrator (one of these days! ), but in the meantime we're using the parts Festiva to dry out fruit. Any location where the temperature gets between 100 and 140 degrees Fahrenheit will work; higher temperatures will cook your fruit rather than drying it, reducing nutrients and flavor, while lower temperatures won't dry the fruit before it goes bad. If you're using a ramshackle dehydrator like ours, you'll want to check on your leather two or three times a day, moving wetter trays into the sunniest spots and removing finished trays. I discovered by accident that if you leave finished trays in the car overnight, just enough moisture will seep back into the leather that it will peel off the tray with ease. Of course, real people use Saran wrap underneath the fruit so that they don't have to pry it loose, but since I don't care about appearances, I ditch the disposables. You can store dried fruit on the shelf for a few weeks, in the fridge for a few months, or just toss it in the freezer like we do. Since around half a gallon of strawberries turns into about a cup of fruit leather, space in the freezer won't be a problem. The real trouble will be keeping your fingers out of this natural, vitamin-rich candy until the cold season rolls back around. Our chicken waterer is the easy solution to poopy water. Beautiful! This is something I could totally do here. Thanks!!! 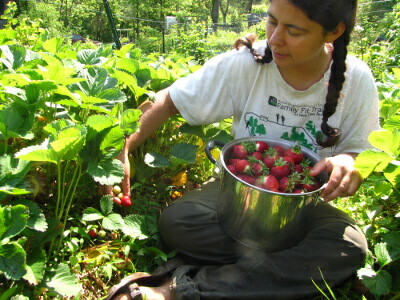 I don't have strawberries (yet) but clearly, they need to move higher up the priority list! You might go ahead and give it a try with any fruits you have in excess. I'm already pondering running raspberries (due to ripen in a couple of weeks) through the foley mill and then drying the juice, and doing the same with the grapes that look like they'll be here in abundance this fall. Just tweak the lemon and honey a bit and use the same recipe. I'm totally in love with homemade fruit leather now. And it's really pretty easy! We already have a quart in the freezer and the fixings of perhaps another quart in the "dehydrator." One of my books recommends oiling the cookie sheet to make peeling easier. I actually ended up with non-stick cookie sheets, because that's all they had in our local small town. I had pondered oiling the sheets before I knew that's what I was going to use, though, but wondered if the oil might not come off on the fruit. It would definitely be worth a try if the leather was sticking badly.